"I do not know what I may appear to the world; but to myself I seem to have been only like a boy playing on the seashore, and diverting myself now and then finding a smoother pebble or a prettier shell than ordinary, whilst the great ocean of truth la"
Isaac Newton's discoveries were so numerous and varied that many consider him to be the father of modern science. A graduate of Trinity College, Cambridge, Newton developed an intense interest in mathematics and the laws of nature which ultimately led to his two most famous works: Philosophiae Naturalis Principia Mathematica (1687) and Opticks (1704). Newton helped define the laws of gravity and planetary motion, co-founded the field of calculus, and explained laws of light and color, among many other discoveries. A famous story suggests Newton discovered the laws of gravity by watching an apple fall from a tree, though there's no proof that this is true. Newton was knighted in 1705. Newton was the first scientist given the honor of burial in Westminster Abbey... He is often ranked 1-2 with Albert Einstein among history's leading physicists... Newton held the Lucasian Chair of Mathematics at Cambridge -- a post later held by Stephen Hawking... Newton was good friends with astronomer Edmond Halley, of Halley's Comet fame. In 1664, while still a student, Newton read recent work on optics and light by the English physicists Robert Boyle and Robert Hooke; he also studied both the mathematics and the physics of the French philosopher and scientist René Descartes. 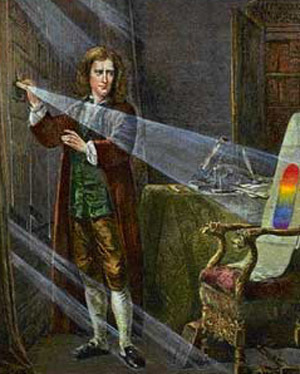 He investigated the refraction of light by a glass prism; developing over a few years a series of increasingly elaborate, refined, and exact experiments, Newton discovered measurable, mathematical patterns in the phenomenon of colour. He found white light to be a mixture of infinitely varied coloured rays (manifest in the rainbow and the spectrum), each ray definable by the angle through which it is refracted on entering or leaving a given transparent medium. He correlated this notion with his study of the interference colours of thin films (for example, of oil on water, or soap bubbles), using a simple technique of extreme acuity to measure the thickness of such films. He held that light consisted of streams of minute particles. From his experiments he could infer the magnitudes of the transparent "corpuscles" forming the surfaces of bodies, which, according to their dimensions, so interacted with white light as to reflect, selectively, the different observed colours of those surfaces. The roots of these unconventional ideas were with Newton by about 1668; when first expressed (tersely and partially) in public in 1672 and 1675, they provoked hostile criticism, mainly because colours were thought to be modified forms of homogeneous white light. Doubts, and Newton's rejoinders, were printed in the learned journals. Notably, the scepticism of Christiaan Huygens and the failure of the French physicist Edmé Mariotte to duplicate Newton's refraction experiments in 1681 set scientists on the Continent against him for a generation. The publication of Opticks, largely written by 1692, was delayed by Newton until the critics were dead. The book was still imperfect: the colours of diffraction defeated Newton. Nevertheless, Opticks established itself, from about 1715, as a model of the interweaving of theory with quantitative experimentation. In mathematics too, early brilliance appeared in Newton's student notes. He may have learnt geometry at school, though he always spoke of himself as self-taught; certainly he advanced through studying the writings of his compatriots William Oughtred and John Wallis, and of Descartes and the Dutch school. Newton made contributions to all branches of mathematics then studied, but is especially famous for his solutions to the contemporary problems in analytical geometry of drawing tangents to curves (differentiation) and defining areas bounded by curves (integration). Not only did Newton discover that these problems were inverse to each other, but he discovered general methods of resolving problems of curvature, embraced in his "method of fluxions" and "inverse method of fluxions", respectively equivalent to Leibniz's later differential and integral calculus. Newton used the term "fluxion" (from Latin meaning "flow") because he imagined a quantity "flowing" from one magnitude to another. Fluxions were expressed algebraically, as Leibniz's differentials were, but Newton made extensive use also (especially in the Principia) of analogous geometrical arguments. Late in life, Newton expressed regret for the algebraic style of recent mathematical progress, preferring the geometrical method of the Classical Greeks, which he regarded as clearer and more rigorous. Newton's work on pure mathematics was virtually hidden from all but his correspondents until 1704, when he published, with Opticks, a tract on the quadrature of curves (integration) and another on the classification of the cubic curves. His Cambridge lectures, delivered from about 1673 to 1683, were published in 1707. A The Calculus Priority Dispute Newton had the essence of the methods of fluxions by 1666. The first to become known, privately, to other mathematicians, in 1668, was his method of integration by infinite series. In Paris in 1675 Gottfried Wilhelm Leibniz independently evolved the first ideas of his differential calculus, outlined to Newton in 1677. Newton had already described some of his mathematical discoveries to Leibniz, not including his method of fluxions. In 1684 Leibniz published his first paper on calculus; a small group of mathematicians took up his ideas. In the 1690s Newton's friends proclaimed the priority of Newton's methods of fluxions. Supporters of Leibniz asserted that he had communicated the differential method to Newton, although Leibniz had claimed no such thing. Newtonians then asserted, rightly, that Leibniz had seen papers of Newton's during a London visit in 1676; in reality, Leibniz had taken no notice of material on fluxions. A violent dispute sprang up, part public, part private, extended by Leibniz to attacks on Newton's theory of gravitation and his ideas about God and creation; it was not ended even by Leibniz's death in 1716. The dispute delayed the reception of Newtonian science on the Continent, and dissuaded British mathematicians from sharing the researches of Continental colleagues for a century. Correspondence with Hooke (1679-1680) redirected Newton to the problem of the path of a body subjected to a centrally directed force that varies as the inverse square of the distance; he determined it to be an ellipse, so informing Edmond Halley in August 1684. Halley's interest led Newton to demonstrate the relationship afresh, to compose a brief tract on mechanics, and finally to write the Principia. Book III shows the law of gravitation at work in the universe: Newton demonstrates it from the revolutions of the six known planets, including the Earth, and their satellites. However, he could never quite perfect the difficult theory of the Moon's motion. Comets were shown to obey the same law; in later editions, Newton added conjectures on the possibility of their return. He calculated the relative masses of heavenly bodies from their gravitational forces, and the oblateness of Earth and Jupiter, already observed. He explained tidal ebb and flow and the precession of the equinoxes from the forces exerted by the Sun and Moon. All this was done by exact computation. Newton's work in mechanics was accepted at once in Britain, and universally after half a century. Since then it has been ranked among humanity's greatest achievements in abstract thought. It was extended and perfected by others, notably Pierre Simon de Laplace, without changing its basis and it survived into the late 19th century before it began to show signs of failing. See Quantum Theory; Relativity. Newton left a mass of manuscripts on the subjects of alchemy and chemistry, then closely related topics. Most of these were extracts from books, bibliographies, dictionaries, and so on, but a few are original. He began intensive experimentation in 1669, continuing till he left Cambridge, seeking to unravel the meaning that he hoped was hidden in alchemical obscurity and mysticism. He sought understanding of the nature and structure of all matter, formed from the "solid, massy, hard, impenetrable, movable particles" that he believed God had created. Most importantly in the "Queries" appended to "Opticks" and in the essay "On the Nature of Acids" (1710), Newton published an incomplete theory of chemical force, concealing his exploration of the alchemists, which became known a century after his death. Newton owned more books on humanistic learning than on mathematics and science; all his life he studied them deeply. His unpublished "classical scholia"—explanatory notes intended for use in a future edition of the Principia—reveal his knowledge of pre-Socratic philosophy; he read the Fathers of the Church even more deeply. 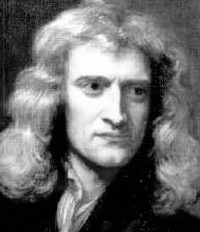 Newton sought to reconcile Greek mythology and record with the Bible, considered the prime authority on the early history of mankind. In his work on chronology he undertook to make Jewish and pagan dates compatible, and to fix them absolutely from an astronomical argument about the earliest constellation figures devised by the Greeks. He put the fall of Troy at 904 BC, about 500 years later than other scholars; this was not well received. VII RELIGIOUS CONVICTIONS AND PERSONALITY Newton also wrote on Judaeo-Christian prophecy, whose decipherment was essential, he thought, to the understanding of God. His book on the subject, which was reprinted well into the Victorian Age, represented lifelong study. Its message was that Christianity went astray in the 4th century AD, when the first Council of Nicaea propounded erroneous doctrines of the nature of Christ. The full extent of Newton's unorthodoxy was recognized only in the present century: but although a critic of accepted Trinitarian dogmas and the Council of Nicaea, he possessed a deep religious sense, venerated the Bible and accepted its account of creation. In late editions of his scientific works he expressed a strong sense of God's providential role in nature. The following tabular summary of Newton's life and work does not pretend to be a comprehensive biography. It simply offers a quick and easy reference guide to the principal milestones in Newton's personal and professional development, and correlates them with contemporary events and publications that influenced him. For those wanting more detailed and nuanced accounts of Newton's life and the various aspects of his thought, there is a wealth of material available online and in print. It would be impossible to provide an exhaustive list of such resources, but most of the best examples are listed on our Links page (for online material) and our Bibliography (for books and articles in print). Note on dates: During Newton's lifetime, two calendars were in use in Europe: the 'Julian' or 'Old Style' in Britain and parts of Eastern Europe, and the more accurate 'Gregorian' or 'New Style' elsewhere. The difference between them lay in their attitude to leap years. At Newton's birth, Gregorian dates were ten days ahead of Julian dates: thus Newton was born on Christmas Day 1642 by the Julian calendar but on 4 January 1643 by the Gregorian. On either 19 February/1 March 1700 or 29 February/11 March 1700 (depending on which calendar is used to measure the gap), this discrepancy rose to eleven days, because there was no 29 February 1700 in the Gregorian calendar. Since some reference sources use one calendar, some the other, and some a mixture of both, this can cause considerable confusion. In the interests of clarifying apparent discrepancies with other sources, both options are given here wherever a particular date is specified. Matters are further complicated by the contemporary English habit of regarding the year as beginning on 25 March. It is here regarded as beginning on 1 January, but notes are added where this may lead to confusion (for instance, the Complete Works of Joseph Mede are dated 1664 but were in fact published in the early months of what we now call 1665). 1642 April (exact date unknown): Marriage of the elder Isaac Newton, an illiterate but quite well-to-do yeoman farmer, to Hannah Ayscough. Oct: Death of the elder Isaac Newton (buried 6/16 Oct.). Death of Galileo Galilei. Marriage of Princess Mary (later Mary II, then aged nine) to William of Orange. Outbreak of English Civil War (Oct.). 1642/3 25 Dec./4 Jan.: Birth of Isaac Newton in Woolsthorpe, Lincolnshire. 1645 Royalist defeat at Battle of Naseby marks the beginning of the end of the Civil War. 1646 27 Jan./6 Feb.: Hannah Newton marries Barnabas Smith, rector of North Witham (about a mile and a half from Woolsthorpe), and moves to North Witham, leaving young Isaac in Woolsthorpe in the care of Hannah's mother, Margery. Birth of Gottfried Wilhelm Leibniz. 1648 Peace of Westphalia ends Thirty Years War in Northern Europe. 1649 Execution of Charles I; England becomes a republic. 1650 Death of René Descartes. 1651 Publication of Thomas Hobbes' Leviathan. 1652 Publication of Elias Ashmole's alchemical verse anthology Theatrum Chemicum Britannicum. 1653 Death of Barnabas Smith. Hannah returns to Woolsthorpe with her three children by her second marriage, Mary (b. 1647), Benjamin (b. 1651) and Hannah (b. 1652). Oliver Cromwell appointed Lord Protector. 1654 Newton is enrolled at King's School, Grantham (about 7 miles from Woolsthorpe). Boards with a Mr. Clark, the town apothecary, who provides the first stimulus to his interest in chemistry. Initially regarded as a poor scholar, he eventually rises to top of the class. Publication of The Marrow of Alchemy by 'Eirenæus Philalethes' (i.e. George Starkey). 1656 Birth of Edmond Halley. c. 1658 Leaves school and is set to learn to manage the family estate. Perhaps wilfully, proves thoroughly incompetent and neglectful. The Grantham schoolmaster, Henry Stokes, and Hannah's brother, William, persuade her to let him return to the Grantham school to be trained for university. Apparently forms a short-lived romantic attachment to Clark's step-daughter (according to a report of her recollections in her old age). Death of Oliver Cromwell (24 Aug./3 Sept. 1658). Succeeded as Protector by his son Richard. 1659-1661 Publication of Lazarus Zetzner's huge alchemical anthology Theatrum Chemicum. 1660 Restoration of Charles II. Foundation of the Royal Society. Publication of Robert Boyle's New Experiments Physico-Mechanicall. 1661 Enters Trinity College, Cambridge (26 May/5 June), first as a subsizar and then a sizar (i.e. paying his way by acting as servant for socially superior fellow-students or for tutors). Further supports himself with a small money-lending operation. Publication of Boyle's Sceptical Chymist. 1662 Apparently undergoes some form of religious crisis: draws up a list of his sins before and after Whitsun that year, presumably in the hope of charting an improvement. His conscience is still troubled by such remembered boyhood sins as 'Stealing cherry cobs from Eduard Storer', 'Calling Derothy [sic] Rose a jade' and 'Squirting water on Thy day [i.e. Sunday]' - but also, more ominously, 'Threatning my father and mother Smith to burne them and the house over them' and 'Wishing death and hoping it to some'. Establishment of the Royal Society by royal charter. 1663 Makes friends with John Wickins, a new arrival at Cambridge, who becomes his room-mate for the next twenty years and works as his assistant. 1664 Probably attends the mathematics lectures given by Isaac Barrow, holder of the newly-instituted Lucasian Chair of Mathematics. Devotes himself to private studies in mathematics and optics, largely ignoring the official university curriculum of classics, Euclidean geometry and Aristotelian philosophy. Begins to fill up his college notebook instead with a series of wide-ranging scientific entries headed 'Quæstiones quædam Philosophiæ' ('Certain Philosophical Questions'). Publication of Boyle's Experiments Touching Colours. Birth of Nicolas Fatio de Duillier, a Swiss mathematician who is later (c. 1689-93) to become Newton's closest friend for a time. Returns to Woolsthorpe for the summer of 1665. Is detained there by the outbreak of plague in Cambridge and remains in Woolsthorpe until March 1667, apart from a short stay in Cambridge in spring 1666 which is cut short by a recurrence of the plague. During this period, despite being almost entirely self-taught in mathematics and optics, he establishes the fundamentals of what is now called the calculus (Newton calls it 'the method of series and fluxions'), setting down the basic rules of differentiation and integration in a paper of October 1666, and demonstrates the heterogeneity of white light through its separation by refraction. Nearly blinds himself by conducting optical experiments on his own eyes. The sight of a falling apple in a Woolsthorpe orchard - or so Newton himself is said to have claimed decades later - focuses his attention on the subject of gravity. Realises that the force required to keep the moon in orbit round the earth (as stated by Kepler in his Third Law) is of the same kind as that operating in terrestrial gravity. However, Newton's theory of universal gravitation is not fully worked out for another twenty years. 1665 Great Plague. Publication of Robert Hooke's Micrographia and of the (posthumous) complete works of Joseph Mede (dated 1664, i.e. early 1665), whom Newton later acknowledges as the greatest influence on his interpretation of Biblical prophecy. 1666 Great Fire of London. Publication of Boyle's Origin of Formes and Qualities. 1667 Made Fellow of Trinity College (22 Sept./2 Oct.). This requires him to subscribe to the Thirty-Nine Articles of the Church of England (a declaration of orthodoxy with particular emphasis on the doctrine of the Trinity), to take a vow of celibacy, and to promise to take holy orders within seven years of receiving his MA. 1668 Awarded an MA. Publication of the Opera chymiatrica (Works of Chemical Medicine) of Jodocus a Rhe (a.k.a. Johannes Rhenanus). 1668-9 Installs elaborate experimental apparatus in his and Wickins' rooms, adding two furnaces for (al)chemical experiments and a copy of Zetzner's monumental Theatrum chemicum in 1669. Constructs the first functioning reflecting telescope (from a design by David Gregory). 1669 Writes 'De analysi per æquationes numero terminorum infinitas' ('On Analysis by Infinite Series'), another milestone on the road to calculus. Barrow retires as Lucasian Professor of Mathematics to become chaplain to Charles II and recommends Newton to succeed him, which he does on 19/29 Oct. Barrow and the mathematician and publisher John Collins urge Newton to publish his work on calculus, but he is reluctant. At Barrow's request, Newton prepares the former's Lectiones opticæ (Optical Lectures) for the press, despite being well aware that his own unpublished optical discoveries are far in advance of Barrow's and contradict many of his conclusions. Publication of Secrets Reveal'd by 'Eirenæus Philalethes' (i.e. George Starkey), an English version of the Introitus apertus that had appeared two years earlier. Publication of Barrow's Lectiones opticæ. 1670 Begins delivering his Lucasian lectures (Jan.), which according to later anecdotes are extremely poorly attended. Lectures on geometrical optics rather than pure maths, putting forward the radical view that the science of colours, and indeed the whole of natural philosophy, is governed by mathematical principles. 1671 Barrow persuades Newton to allow him to demonstrate the telescope to the Royal Society, where it causes a sensation. Newton writes De methodis serierum et fluxionum (On the Method of Series and Fluxions), expounding the principles of calculus, though this is not published until 1736. Publication of John Webster's Metallographia and of Henry More's Enchiridion metaphysicum. 1672 Elected Fellow of the Royal Society (1/11 Jan.). Newton's 'Theory about Light and Colors' published in the Royal Society's journal, Philosophical Transactions (30 Jan./9 Feb.). Critical reactions from various quarters, and especially from the Society's own Curator of Experiments, Robert Hooke, elicit furious responses from Newton and embroil him in numerous polemical exchanges for the next four years, during which he repeatedly declares himself unwilling to engage in any further scientific publication or correspondence. However, he intermittently keeps up a vicious semi-public quarrel with Hooke until the latter's death in 1703. Outbreak of Third Anglo-Dutch War. 1673 Cold-shoulders various attempts to persuade him to re-engage with the scientific community and concentrates harder on his still almost totally secret (al)chemical studies. At about this date, he also begins an intensive study of the textual history of the Bible (both in the original and in various translations) and of the Church Fathers, which continues to occupy him for the rest of his life and soon leads him to conclude that the doctrine of the Trinity is a heretical error introduced in the 4th century AD. Leibniz elected Fellow of the Royal Society. Publication of Christian Huygens' Horologium oscillatorium (Of Pendulum Clocks). 1674 End of Third Anglo-Dutch War. 1675 Visits London in spring to ask the Secretary of State, Joseph Williamson, for a dispensation from taking holy orders, as the statutes of Trinity require him to do as an MA of seven years' standing. This is granted and the statutes altered for Newton's benefit. It is not clear what grounds he argues for his exemption, though his private reasons are almost certainly his dissent from the Church's teaching on the Trinity. Sends the Royal Society a 'Hypothesis' concerning the causes of light and colours. This is closely related to an alchemical essay, 'Of natures obvious laws and processes in vegetation', written (but not disclosed) by Newton at about the same time. Relations with Hooke worsen as the latter thinks Newton credits himself in the 'Hypothesis' with a number of ideas Hooke had already put forward in his Micrographia (1665). Greenwich Observatory founded, with John Flamsteed as the first Astronomer Royal. 1676 Leibniz visits London in October and (without Newton's knowledge) is shown a copy of Newton's 'De Analysi' by John Collins. However, Leibniz has already independently established the fundamental principles of calculus, though (as he later acknowledges) he learns much from Newton's work on series expansion. 1677 Death of Isaac Barrow. 1678 Publication of Ralph Cudworth's True Intellectual System of the Universe. Publication of Ripley Reviv'd by 'Eirenæus Philalethes' (i.e. George Starkey). 1679 Returns to Woolsthorpe in the spring to nurse his dying mother (buried 4/14 June). Newton remains in Woolsthorpe for most of the year settling the family's affairs. Birth of Newton's half-niece Catherine Barton. 1679-1680 Correspondence with Hooke about the path of falling bodies provides Newton with the key dynamic concepts of inertia and centripetal attraction. 1681 Correspondence with Flamsteed about the comets of November and December 1680, which Flamsteed maintains are one and the same. Newton initially disagrees but later acknowledges Flamsteed was right: this has further important implications for Newton's understanding of gravity. c. 1683 Wickins resigns his fellowship and leaves Cambridge (probably to allow him to marry, which he cannot do as a Fellow). Newton invites Humphrey Newton (no relation) to share his rooms and work as his amanuensis. 1684 August: Halley visits Newton to discuss astronomical matters, particularly the notion of gravity. The two get on well and Halley becomes one of Newton's staunchest supporters. 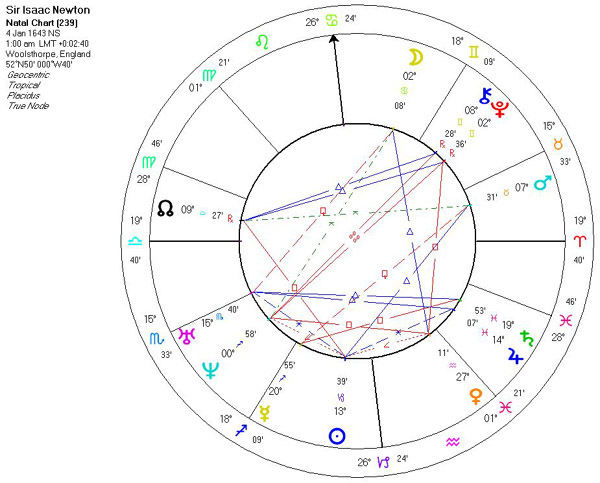 Correspondence with Flamsteed about the possibility of an attraction between Jupiter and Saturn. Leibniz publishes an account of his calculus in the Leipzig-based journal Acta Eruditorum. 1685 Accession of the Roman Catholic James II (27 Jan./6 Feb.). 1686 Fully formulates his theory of universal gravitation: every object in the universe attracts and is attracted to every other object. Publication of Edmund Dickinson's alchemical Epistola ad Theodorum Mundanum (Letter to Theodorus Mundanus). 1687 Plays a significant role in orchestrating opposition to the King's demand that Sidney Sussex College award an MA to a Benedictine monk, Alban Francis, without requiring him to take the statutory oath of allegiance to the Church of England - despite the fact that Newton, as a convinced but secret unitarian, owes the Church of England no more allegiance than Francis does. Newton and other delegates face examination by Judge Jeffreys, and Vice Chancellor John Peachell is sacked, but the college stands its ground and the degree is never conferred. July: largely at Halley's urging and entirely at Halley's expense, publishes Philosophiæ naturalis principia mathematica (The Mathematical Principles of Natural Philosophy), his masterwork on mechanics, fluids and gravity. Though few outside England are initially convinced by Newton's theory of gravity, the book establishes his reputation throughout Europe as at least one of the greatest mathematicians and scientific thinkers of his day. Death of Henry More. 1688 Petition of Seven Bishops against James II's toleration of Roman Catholics. The 'Glorious Revolution': arrival from the Netherlands of the Protestant William of Orange and his army (Nov.) and flight of James (Dec.). 1689 Elected MP for Cambridge University. Applies for provostship of King's College, Cambridge, but (much to his chagrin) is not appointed. Now seen as something of a superstar in English intellectual circles, Newton acquires a devoted following of mostly younger disciples, many of whom come to share his unorthodox theological views as well as championing his natural philosophy. At this time or a little earlier, makes friends with the philosopher John Locke and with the Swiss mathematician Fatio de Duillier: his friendship with the latter is arguably the one really close relationship of Newton's life. Terminates Humphrey Newton's service as his amanuensis. Accession of William III and Mary II (James II's sister). Publication of The Cambridge Case, an anonymous account of the Sidney Sussex affair (probably not Newton's composition though he may well have had a hand in it). Publication of Le triomphe hermétique (The Hermetic Triumph) by Alexandre Toussaint de Limojon, Sieur de Didier. 1690 Writes two long letters to Locke, and a shorter supplement, concerning 'corruptions of Scripture', explicitly stating his own anti-trinitarian convictions. Begins revising the Principia and elaborating on his conviction that true (i.e. Newtonian) natural philosophy was known to the sages of various pre-Christian civilisations and represented in veiled, allegorical form in myths and in the design of ancient temples and monuments such as Stonehenge. Maintains that all 'his' discoveries are in fact re-discoveries of 'prisca sapientia' ('ancient wisdom'). Publication of Boyle's The Christian Virtuoso and Locke's Essay Concerning Human Understanding. 1691/2 Death of Boyle (31 Dec./10 Jan. - at quarter to one in the morning, for which reason many sources treat the date as 30 Dec./9 Jan.). His will endows the Royal Society's Boyle Lectures in defence of religion. 1692-3 Correspondence with the mathematician Richard Bentley on the value of natural philosophy as a proof of God's existence and a bulwark of true religion. Correspondence with Locke about alchemy. Locke, who is one of a team appointed to inspect Boyle's manuscript legacy, sends Newton copies of two alchemical recipes he finds among the papers. Bentley delivers the first Boyle lectures (1692), drawing heavily on his reading of and correspondence with Newton, and publishes them (1693). 1693 Invites Fatio to take rooms next to his in Cambridge, though this plan is never realised. Suffers a nervous breakdown (c. July/August). Writes distractedly to Locke in September apologising for having imagined 'that you endeavoured to embroil me wth woemen' and that 'when one told me you were sickly ... I answered twere better if you were dead'. Explains a month later that 'when I wrote to you I had not slept an hour a night for a fortnight together & for 5 nights together not a wink'. Has regained his composure by the end of the year. From this point on, has little if anything more to do with Fatio (the reasons for this rupture remain obscure). 1694 Presses Flamsteed for data on the moon's motion, which Newton still cannot satisfactorily explain in terms of his gravitational theory. Deeply offends Flamsteed by telling him not to waste time on his own theoretical speculations on the subject but to concentrate on collecting and supplying better data. Death of Mary II leaves William III as sole monarch. 1696 Visited in March by an anonymous 'adept' who reveals what he claims is a 'menstruum' to dissolve all metals. Probably in about this year, Newton composes (but does not publish) the essay 'Praxis', the most substantial of his own (al)chemical compositions. However, his practical research into the subject seems to be abandoned at about this date, though he continues to collect books and manuscripts. Appointed Warden of the Royal Mint (19/29 March), which is housed at this date in the Tower of London. Leaves Cambridge on 20/30 April to settle in London. Though the post has traditionally been treated as a sinecure, Newton (much to the annoyance of the other Mint officers) takes his duties very seriously indeed, waging vigorous campaigns against the institution's endemic corruption and inefficiency. At some point after this move, probably before 1700, Catherine Barton (b. 1679), the daughter of Newton's half-sister Hannah (née Smith), comes to live with him in London. Silver recoinage in England (till 1698). 1697 Publication of John Pollexfen's Of Trade, Coin and Paper Credit, an attack on credit and paper money. 1699 Fatio publishes a work asserting Newton's priority in the discovery of calculus and heavily implying that Leibniz stole the idea from him (though Newton himself acknowledged in the Principia that Leibniz had reached at least some of the same conclusions independently). Newton later denies having had any hand in the publication. 1700 At his own request, Newton transfers from being Warden to Master of the Mint (a nominally less prestigious but in fact more influential and lucrative position). The appointment is made on 25 Dec. 1699/4 Jan. 1700 - a birthday present. Leibniz responds to Fatio's criticisms in the Acta Eruditorum, and an increasingly bitter and personal dispute erupts between Leibniz and Newton, waged - on both sides - largely through third parties or under cover of anonymous publication. This preoccupies both men until Leibniz's death (and Newton until his). Exacerbated more or less wilfully by the seconds of both parties, the argument swells to encompass attacks on Leibniz's views on miracles and 'pre-established harmony' (later satirised by Voltaire as the doctrine that 'all is for the best in the best of all possible worlds') on the one hand, and Newton's theory of gravity on the other. Second edition of Pollexfen's Of Trade, to which Newton writes (but never publishes) an extensive rejoinder. 1701 Again elected MP for Cambridge University. Appointment of Newton's friend and fellow unitarian Hopton Haynes to the Mint post of weigher and teller. Officially resigns as Lucasian Professor (Dec.), having held the post in absentia for over five years, and is succeeded by his protégé William Whiston. Outbreak of the War of the Spanish Succession. Act of Settlement debars Roman Catholics from the British throne. 1702 Designs Queen Anne's Coronation Medal. Accession of Anne. 1703 Elected President of the Royal Society, a post he holds (by annual re-election) until his death. Death of Robert Hooke. 1704 Publishes Opticks, his second masterpiece, setting out the principles of refraction and arguing for the corpuscular nature of light. 1706 Publication of Optice, a Latin translation of the Opticks. Fatio becomes deeply involved with a sect of controversial and much-derided radical mystics, the 'French Prophets'. Publication of A Demonstration of the Being and Attributes of God by Newton's protégé Samuel Clarke. 1707 Fatio and other 'French Prophets' pilloried in London. Union of England and Scotland. Silver recoinage in Scotland (to 1709) and re-organisation of the Edinburgh Mint. 1710 Ejection of Whiston from Lucasian Professorship for his advocacy of unitarianism (Oct.). 1712 At Leibniz's somewhat naive request, the Royal Society appoints a committee to review the history of the calculus controversy. The committee is selected by the Society's President - Newton - who also compiles its report for it. Consisting principally of carefully selected extracts from relevant scientific correspondence, with explanatory notes, the report emphatically (and quite correctly) asserts Newton's priority, and heavily (and quite unjustly) implies plagiarism on Leibniz's part. Uses his authority as President of the Royal Society to compel Flamsteed, who is still smarting from the lack of credit given him for his contributions to the Principia, to hand over an unfinished star-chart and compilation of astronomical observations to be completed and edited by Halley. Publication of Samuel Clarke's Scripture Doctrine of the Trinity (in fact a work with a distinctly anti-trinitarian flavour). 1713 Publication of the 1712 calculus report as Commercium epistolicum ... de analysi promota (Correspondence ... Relating to the Progress of Analysis). Second edition of the Principia, with the acknowledgments of Leibniz toned down and all reference to Flamsteed excised. Adds a 'General Scholium' setting out Newton's view of the relationship between God and Creation. The new preface by Newton's disciple Roger Cotes denounces Leibniz as a 'miserable reptile'. Peace of Utrecht ends British involvement in War of the Spanish Succession. 1714 Accession of George I. 1715 Devotes almost an entire issue of the Philosophical Transactions to 'An Account of the Book entituled Commercium Epistolicum', his own anonymous review of his own report on the calculus controversy. Flamsteed acquires most of the copies of Halley's edition of his star-chart and burns them. 1716 Draws up a summary of his theories on ancient chronology at the request of Princess Caroline of Wales, asking her to keep the manuscript to herself (which she does not). Death of Leibniz. 1717 Marriage of Catherine Barton to John Conduitt. 1718 Second English edition of the Opticks. 1719 Second Latin edition of Optice. Death of Flamsteed. 1720 Newton is said to have lost £20,000 in the South Sea Bubble according to Catherine Conduitt. South Sea Bubble. Halley succeeds Flamsteed as Astronomer Royal. 1721 Third English edition of the Opticks. 1722 Begins to suffer from bladder stones and is increasingly forced to delegate his duties at the Royal Society and Mint to others (in the case of the Mint, largely to Conduitt, who eventually succeeds him as Master). 1725 Unauthorised publication, in Paris, of Abregé de la chronologie de M. le Chevalier Newton, a French translation of the 'Abstract of Cronology [sic]' Newton had written in 1716, with adversely critical commentary by the translator. Newton promptly publishes a withering rejoinder in the Philosophical Transactions. Posthumous publication of Flamsteed's Historia coelestis britannica (British History of the Heavens), his own completion of the work he had been forced to surrender unfinished to Halley. 1726 Third edition of the Principia. 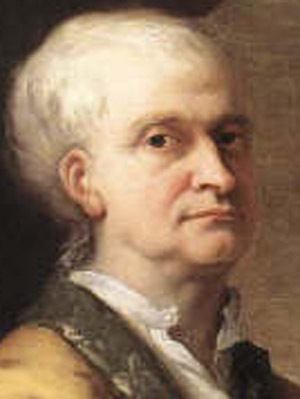 1727 Presides over his last Royal Society meeting on 19 Feb./2 March. Shortly afterward takes to his bed, suffering from a new bladder stone. Dies, having refused the last rites, on 20/31 March. Sir Isaac Newton (25 December 1642 – 20 March 1727 by the Julian calendar in use in England at the time; or 4 January, 1643 – 31 March 1727 by the Gregorian calendar) was an English physicist, mathematician, astronomer, philosopher, and alchemist who wrote the Philosophiae Naturalis Principia Mathematica (published 5 July 16871), where he described universal gravitation and, via his laws of motion, laid the groundwork for classical mechanics. Newton also shares credit with Gottfried Wilhelm Leibniz for the development of differential calculus. While they both discovered calculus nearly contemporaneously, their work was not a collaboration. Newton was the first to promulgate a set of natural laws that could govern both terrestrial motion and celestial motion. He is associated with the scientific revolution and the advancement of heliocentrism. Newton is also credited with providing mathematical substantiation for Kepler's laws of planetary motion. He would expand these laws by arguing that orbits (such as those of comets) were not only elliptic, but could also be hyperbolic and parabolic. He is also notable for his arguments that light was composed of particles (see wave-particle duality). He was the first to realise that the spectrum of colours observed when white light passed through a prism was inherent in the white light and not added by the prism as Roger Bacon had claimed in the 13th century. Newton also developed a law of cooling, describing the rate of cooling of objects when exposed to air; the binomial theorem in its entirety; and the principles of conservation of momentum and angular momentum. Finally, he studied the speed of sound in air, and voiced a theory of the origin of stars. The following is a brief biography of Newton's early life. For more in-depth information, see Isaac Newton's early life and achievements. Newton was born in Woolsthorpe-by-Colsterworth, a hamlet in the county of Lincolnshire.Newton was premature and no one expected him to live. His mother also said that his body at that time can even fit inside a quart mug. His father had died three months before Newton's birth. When Newton was two years of age, his mother went to live with her new husband, leaving her son in the care of his grandmother. Newton was educated at Grantham Grammar School. In 1661 he joined Trinity College, Cambridge, where his uncle William Ayscough had studied. At that time the college's teachings were based on those of Aristotle, but Newton preferred to read the more advanced ideas of modern philosophers such as Descartes, Galileo, Copernicus and Kepler. In 1665 he discovered the binomial theorem and began to develop a mathematical theory that would later become calculus. Soon after Newton had obtained his degree in 1665, the University closed down as a precaution against the Great Plague. For the next two years Newton worked at home on calculus, optics and gravitation. Tradition has it that Newton was sitting under an apple tree when an apple fell on his head, and this made him understand that earthly and celestial gravitation are the same. 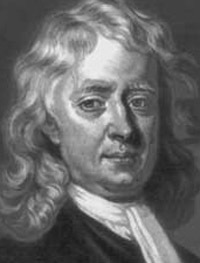 A contemporary writer, William Stukeley, recorded in his Memoirs of Sir Isaac Newton's Life a conversation with Newton in Kensington on 15 April 1726, in which Newton recalled "when formerly, the notion of gravitation came into his mind. It was occasioned by the fall of an apple, as he sat in contemplative mood. Why should that apple always descend perpendicularly to the ground, thought he to himself. Why should it not go sideways or upwards, but constantly to the earth's centre." In similar terms, Voltaire wrote in his Essay on Epic Poetry (1727), "Sir Isaac Newton walking in his gardens, had the first thought of his system of gravitation, upon seeing an apple falling from a tree." This is an exaggeration of Newton's own tale about sitting by the window of his home (Woolsthorpe Manor) and watching an apple fall from a tree. It is now generally considered that this story was invented by him in his later life, to illustrate how he drew inspiration from everyday events. 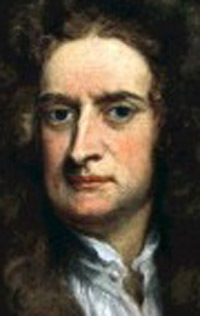 Newton became a fellow of Trinity College in 1667. In the same year he circulated his findings in De Analysi per Aequationes Numeri Terminorum Infinitas (On Analysis by Infinite Series), and later in De methodis serierum et fluxionum (On the Methods of Series and Fluxions), whose title gave the name to his "method of fluxions". Newton and Leibniz developed the theory of calculus independently and used different notations. Although Newton had worked out his own method before Leibniz, the latter's notation and "Differential Method" were superior, and were generally adopted throughout the English-speaking world. (Curiously, in Germany the Newtonian notation is more popular.) Though Newton belongs among the brightest scientists of his era, the last twenty-five years of his life were marred by a bitter dispute with Leibniz, whom he accused of plagiarism.